Become CWDS’ Senior Content Strategist and help determine the voice and tone of the one of the largest child welfare case management systems in the country. In this role you will be working directly with digital service creators and end-users throughout the entire design and development process. You will be responsible for researching and creating CWDS content strategy style guides, user experience writing for content requirements and creating content strategy deliverables across various digital service teams. Your research deliverables will further inform information architecture and data organizational strategy. Learn more by reading the full job description and bulletin online. CWDS is designing, developing and implementing a new and innovative system, called CWS-CARES, that replaces a 20 year-old legacy system used by child welfare case workers across the state’s 58 counties. Our project uses free and open source software, Agile methodologies and user-centered design principles and is seeking talented professionals who can develop and manage content in this environment. We are seeking high-level thinkers who are also standout idea generators and problem solvers with excellent communication and organizational skills. This position requires strong analytical abilities necessary to gather key business and user insights, who can apply their strategic planning skills to create a long-term vision for the content generation. You will join a team of 12 researchers and designers and work closely with product owners, stakeholders, policy, and data scientists to create, curate and manage content. This position is located in beautiful Sacramento, California, in our modern, open-plan, collaborative workspaces. To learn more about the team’s approach, see the Design Team Wiki. Sign up for the CWDS newsletter to get future project updates. There are many exciting career opportunities available at Child Welfare Digital Services. With the support of skilled, dedicated employees and the goal to improve the lives of children at risk of abuse and neglect, CWDS employees are committed to working in an agile environment to make this happen. If you are looking for new challenges and a rewarding profession, then we encourage you to consider a career with us. Stay updated on the latest opportunities by checking our career page here. Child Welfare Digital Services is looking for an experienced Service Desk Manager, classified as a Data Processing Manager II. The position includes the opportunity to work on a wide variety of technologies while providing support to the Office of Systems Integration, Child Welfare Digital Services (CWDS) project Service Desk unit. The newly created Service Desk Manager position has been established to plan, organize, and oversee the efforts of the service desk team that will support the new system used by county social workers across California. The selected candidate will be responsible for leading the day-to-day operations of the Service Desk, delighting our end users, and meeting or exceeding service levels. The Service Desk Manager will effectively communicate with customers, solve problems and work in a fast-paced environment. The candidate must be able to manage their time effectively and work independently with minimal supervision. Be a part of California’s largest, most innovative project, the spotlight of national focus as government changes the way it does business. Learn more and apply for the position here. See our job flyer here. Child Welfare Digital Services is hiring a Scrum Master and Project Management Lead (both positions classified as Senior Information Systems Analysts) to work in the Project Management Office (PMO). Learn more about the positions here. With the recent internal promotion of its project director, Child Welfare Digital Services (CWDS) is recruiting to fill the key position that runs day-to-day operations overseeing the administrative and customer support functions of the project to replace California's legacy child welfare system for county social workers. "We are looking for a talented leader to join California’s largest and most innovative project, the focus of national attention as government seeks to fundamentally change the way we do business," said Office of Systems Integration (OSI) Director John Boule. "This is an exciting opportunity to serve the public, to give back while being part of this monumental initiative." With a staff of more than 70, which includes the Project Management Office (PMO), the project director is responsible for overseeing contract management, budgeting, human resources, customer relations, state and federal reporting and the project’s overall implementation. The project director, officially classified as a Data Processing Manager IV, will work alongside the product director, both reporting to recently promoted Office of Systems Integration Deputy Director Tony Fortenberry. 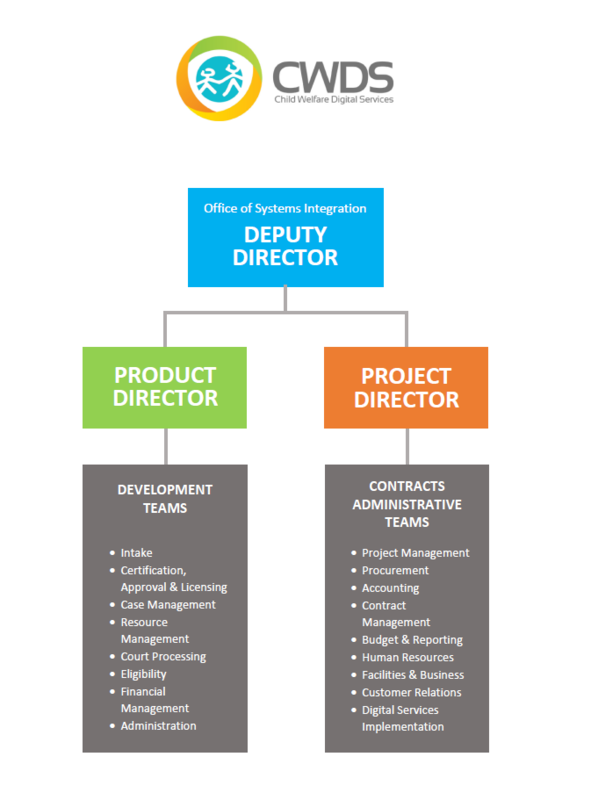 CWDS is preparing for a national recruitment effort to fill the product director position. "We are looking for a candidate who thrives on collaboration and can build strong relationships with the user community and county stakeholders," said OSI Chief Deputy Director Peter Kelly. "This individual must be a champion of best practices, an effective planner and decision maker, and be a strong advocate for using technology to support the mission of social workers to protect California's children." As a part of the California Health and Human Services Agency (CHHS) within OSI, CWDS is developing a modern platform and infrastructure to replace the 20-year-old legacy child welfare management system used by county case workers. The project consists of eight digital services to replace the Child Welfare System/ Case Management System (CWS/CMS) that manages work for county child protective services programs, foster home approvals and licensing, and other critical functions that allow case workers to protect children. CWDS is pioneering the development and operation of cloud-based software in the public sector, following a DevOps project lifecycle rather than a traditional design, development and implementation (DDI) / maintenance and operations (M&amp;O) model. The project is taking an innovative new approach for California state government, using agile methodologies, free/open source software (FOSS) and user-centered design. In November of 2015, after a decade of planning, the project changed its development strategy from the traditional “waterfall” approach to using agile methodologies which focus on iterative development cycles and a rapid feedback loop with end-users. Agile teams work in two-week sprints with daily status meetings to measure progress. With the project’s first code release in March, teams of state staff and contractors, including designers, developers and project managers, have been working toward full velocity under the new approach. Momentum is building as more developer teams are joining the effort each month. CWDS is hiring an Agile Coach to support our Digital Service Teams. The CWDS project consists of eight digital services to replace the legacy system that manages casework for county child protective services programs, foster home approvals and licensing, and other critical functions that allow case workers to protect children. With the project’s first code release in March, teams of state staff and contractors, including designers, developers and project managers, have been working to get started under the new approach. Momentum is building as more developer teams will be hired in the coming months. In November of 2015, the project changed its development strategy from the traditional “waterfall” approach to using agile methodologies which focus on iterative development cycles and a rapid feedback loop with end-users. Agile teams work in two-week sprints with daily status meetings to measure progress. The new approach includes DevOps teams, placing a strong emphasis on collaboration between network engineers, developers, business program managers and state and county subject matter experts. Child Welfare Digital Services (CWDS) is recruiting for a Product Owner (Sr. Information Systems Analyst) to assume responsibility for the day-to-day oversight of the Case Management Digital Service, the largest of eight services under development to create the system that will replace the existing Child Welfare Services / Case Management System (CWS/CMS) used by county case workers across California. The Product Owner is responsible for developing software, from concept to delivery, to provide state and county workers with a simple and efficient tool for maintaining a child welfare case record in a variety of situations, including: community-based or voluntary services, court supervised in home services, family reunification services, and permanency planning services. This position guides and directs a team of software designers and developers to design, test, and deliver user-centered software using agile-based methodologies to meet the Service Manager's vision and goals for the ultimate product. The Case Management Digital Service will provide county Child Welfare Agencies a comprehensive, automated case management system that fully supports the child welfare practices and incorporates the functional requirements mandated by federal regulations. See our job flyer for more information. California is recruiting for a chief to lead development on one of its highest profile systems, the Child Welfare Digital Services project to replace a 20 year-old legacy system used by case workers across the state’s 58 counties. Using open source software, agile methodologies and user-centered design, the project is embarking on an innovative new approach for California state government. “All eyes are on this demonstration project, California’s first major effort using agile methodologies which represents a fundamental shift in the way state government approaches technology,” said Office of Systems Integration Director John Boule. “A year and a half ago we abandoned the decade-old monolithic approach on this project, in favor of a modern, innovative strategy modeled after examples in the private sector and more recent success stories in the federal government. Child Welfare Digital Services is reaching beyond California to find candidates to fill this role, classified as an official state position to oversee all application development activities on the project. More details on the Development Chief position can be found here. The project consists of eight digital services, or modules, to replace the legacy system that manages casework for county child protective services programs, foster home approvals and licensing, and other critical functions that allow case workers to protect children. With the project’s first code release in March, teams of state staff and contractors, including designers, developers and project managers, have been working to get started under the new approach. Momentum is building as more developer teams will be hired in the coming months. The effort to replace the legacy CWS/CMS system began in 2004 with the Go Forward Plan to modernize the system, leading to the CWS Web project, approved in 2006. The California Legislature suspended the project in 2011, due to budget constraints, and required a study of CWS/CMS to answer specific question related to the existing system and approaches to address missing functionality. The Child Welfare Services – New System (CWS-NS) project received budget approval to move forward in July 2012.